At HootSuite, the professional Twitter client, we want to live up to our name, so we’re constantly listening to you and implementing improvements. Our newest update adds exciting new features, including file sharing and auto-complete. Many of our users have requested this feature, and we’ve obliged. Within HootSuite, you can now upload pictures by pressing the picture icon. Once you’ve uploaded your image, HootSuite will return an ow.ly URL for you to tweet — making it trackable through our custom analytics. Every picture uploaded is hosted on ow.ly. By logging into ow.ly, you can also administer your galleries. This is yet another way we’ve pushed Twitter to amazing new heights. Now you can share files on Twitter. HootSuite is the first major Twitter client to support this exciting feature. Similar to picture uploading, you must instead click the document icon. HootSuite supports many document formats: Word, Excel, PowerPoint, PDF, Photoshop, and MP3 files. As with pictures, links to files are trackable with HootSuite’s custom analytics. Ever forgotten someone’s Twitter username? HootSuite’s new auto-complete feature helps you overcome this problem. Once you type a name, HootSuite remembers it. With your next reply, HootSuite automatically generates a list of the names you most frequently engage with. 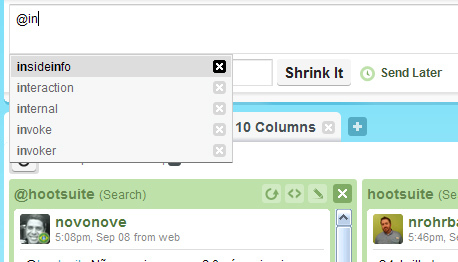 You can also remove someone from auto-complete by pressing the “x” button beside their name. What will HootSuite do next? We’ve got lots of goodness planned, but we welcome all feature requests. What features would you like to see added to HootSuite in our next update?